You’ve customized your dietary restrictions and scheduling preferences, and Real Plans has generated a meal plan based on your selections, but what if you want to change one of the recipes or add an extra side dish to a meal? You’ve customized your dietary restrictions and scheduling preferences, and Real Plans has generated a meal plan based on your selections, but what if you want to change one of the recipes or add an extra side dish to a meal? What if kohlrabi came in your CSA box and you have no idea what to do with it? What if you usually have leftovers for lunch, but tomorrow you’d like a salad? Enter Recipe Roulette, the tool that allows you to do all this and more! From your Meal Planner, click on the word “Actions” in the upper right hand corner and choose “Recipe Roulette from the dropdown. Small roulette wheels will pop up in each meal slot. Click the wheel ( )in the meal you slot you wish to change. You are now in Recipe Roulette! If you don’t like the recipe that pops up on Roulette or would like to see what else is offered, simply click to scroll through the recipes until you find one you like. (Clicking does not mean you will never see that recipe again; it just means, “Show me the next recipe.”) The arrow on the left will take you back to the previous recipe. If you have a particular ingredient on hand, need to use extra produce before it goes bad, or want to make a recipe using something that came in your CSA box, you can search that ingredient in the Filter box to find recipes to add to your plan! You can also search by any Tag, Course, Cuisine, Diet Type, Main Ingredient, or other needs you might have. Want to cook beef in the pressure cooker? Type in “pressure cooker beef” for recipes. Cooking for a friend on Keto but you don’t want anything too complicated? Type in “simple Keto”. The possibilities are practically endless! Only recipes meeting your dietary preferences will show up here, so you never have to worry about getting recipes that do not meet your restrictions. 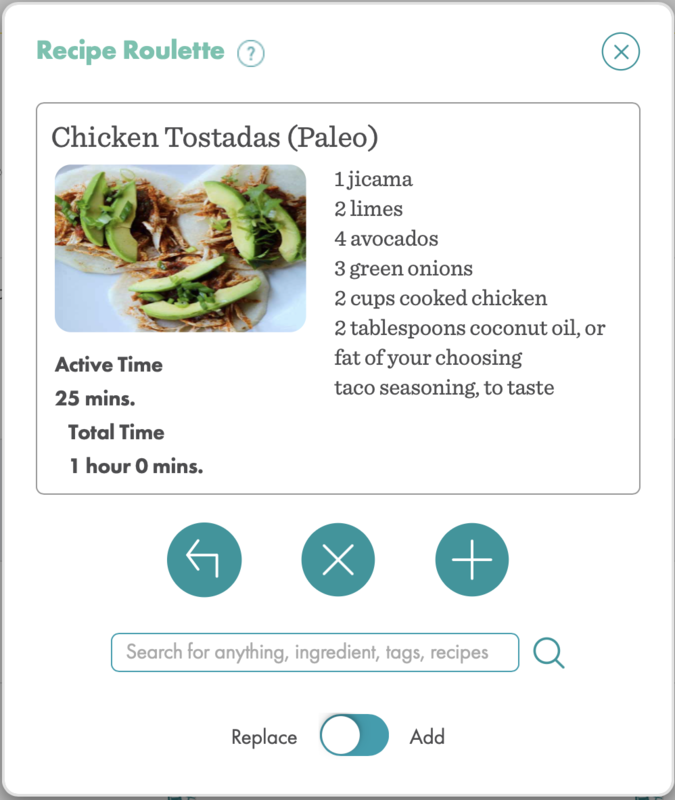 Recipe Roulette makes it fun and easy to quickly update your Meal Planner whenever the need arises. Note: Recipe Roulette will assign meals to your planner using your default serving sizes and “My Diet” selections. If you have Advanced Filters set up for a soup to serve 2 on Tuesday’s lunch, for example, you would need to enter “soup” in the Filter box and manually change the servings to 2 once you have added the recipe to your Meal Planner’s Tuesday lunch slot. Please visit us in chat if you need us!